Testimonals - Ready to Work Inc Perth Western Australia - helping disadvantaged, disabled and long-term unemployed women find employment. "I would like to thank Ready to Work for their wonderful help with supplying me with a business outfit that I could wear to my interview. The moment I entered through the door of your premise, I was greeted by two lovely ladies who gave me warm smiles and we chatted briefly in regards to what kind of jobs I was aiming for. The appropriate clothing to cater for these interviews were chosen and I was trying on and modelling them. I was so very happy with the clothing and pair of shoes, and I was also given a handbag to finish off the outfit. I was successful in my interview and am now working full time. I love getting up and going to work every day, and Ready to Work made me feel very professional and they also boosted my confidence. I would like to say thank you so very much. It is nice to know that there are people, and organisations, out there willing to help people returning to the workforce", says Sharon, November 2013. "I just wanted to thank you for the assistance you gave me in regards to interview techniques and the outfits you provided me recently. I started my new job yesterday. I thought both you, and your lovely volunteers, were all beautiful and gave me the little boost I needed to move forward", says Anne, June 2013. "Thank you to all who assisted me today to find a corporate outfit for my new job. I got home and laid out my outfits and burst into tears with happiness. It means so much to me that people care enough to give to other women going through tough times. In a society where looks and image are so important to make what may seem such a small difference is really a very huge one for someone's confidence and self esteem. The quality of the clothes and accessories were astounding. Thank you so much", says Martha - May 2013. "I arrived late and nervous, and left feeling great and ready for the next step of my journey. You made me feel like I had been welcomed into your home and you just seemed to know what clothing would suit me. I felt comfortable yet like I could take on any interview I may get. Thank you again. I hope to someday have the same effect on people, that you had on me today", says Kristina - Feb 2013. I'm just sending you this email to thank you so much for your assistance yesterday. I'll be honest, when I came in yesterday I was feeling a little bit deflated, I've spent a lot of my life doing voluntary work and to be on the other end of it wasn't something I was handling too well, however in saying that, by the time I left you yesterday I felt like a million dollars. You are both the most lovely women I think I've met and certainly know how to make a woman feel good. Thank you from the bottom of my heart and if the old saying "what goes around comes around" is true, I suspect you both have a great life ahead of you. Wishing you all the best. Genevieve. Ready to Work client December2012. Here's just some of the feedback that we regularly receive from our network of referring agencies to letus know of the difference we are making to our shared clients lives. "Wow Gwen, Jan looks amazing! Thank you so much for your time and input. I'm sure the involvement of Ready to Work will make a positive impact on Jan's confidence and ability to successfully return to work. 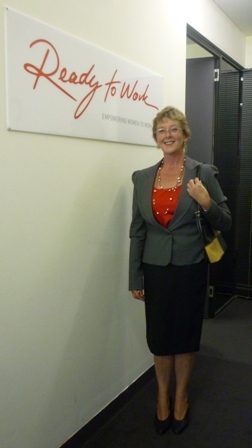 It's a fantastic service you provide", says Anna, Senior Rehabilitation Consultant, CRS Australia. "Kylie looks great - and so happy too! Thanks for helping her and for informing me about how it sent today. This will make a huge difference to her confidence when she starts work on Monday. You guys do a fantastic job. We are so very grateful. Thank you all! See you next time", says Marie, Ruah Workright. A recent client phoned her consultant on the way home from her appointment this afternoon to say how blown away she was with the support, help and provision of clothes she received from Ready to Work today. She is very excited to be able to wear her new dress tomorrow for her interview. So another amazing job, thank you! "I was browsing Lotto West and came across your video which led me to your website. I am really amazed and excited about the work you are doing - it is SO needed. The reason why I know this is because just under two years ago I was in a financial circumstance where I could not pay my bills, and I mean serious bills, all my clothes except for one suitcase's worth was in another state and I had to dress corporate city. I had no way of getting my clothes and other household goods over here and I had no other choice than to buy my clothes, shoes and handbags at op shops. It has only been in the last 10 months I've been able to get some new things, but even then, if its from a store like Sussan's it has to be on special. Now I would not have missed this experience for the world because it was a brilliant way to put both my feet firmly on the ground, although I would not like to go through it again. For the first time in my life I fully understand how easy it is to get into a financial pickle, and getting a job to get out of that pickle is easier said than done. It made me understand how hard it was for the long term unemployed, the homeless, and families and individuals with limited income. There is a lot more to getting and keeping a job than getting the interview. You have no idea how buoyed I am knowing there is a place where women can go to get all the help they need to participate in the workforce. It sounds like you supply a tremendous morale support as well which, believe me, when you know you are so poor you can't even dress yourself is needed! Best wishes for the continuation of your fantastic work".